Liquid error: undefined method `select!' for #<ContentNode::ActiveRecord_Associations_CollectionProxy:0x000055b3b4e081d0> Did you mean? select _select! In a hearing last week, an exchange between Rep. Katie Porter (D-CA) and JPMorgan’s CEO Jamie Dimon caught my eye. Dimon was touting the bank’s new minimum wage of $16.50, increasing to $18 in high-cost areas, for entry level workers. That’s a decent minimum wage, above the $15 that most progressive plans call for (and those proposals typically include a phase-in of numerous years). According to recent EPI analysis, $16.50 is well north of the national 40thpercentile wage of just under $15. To be clear, I’m not suggesting the highly profitable bank—market cap about $380 billion; Dimon made over $30 million last year—is fairly compensating its entry-level workers (Dimon says such workers tend to just out of high school). My point is an empirical one: given the nation’s wage structure, its (ridiculously low) federal minimum wage of $7.25, and the weak bargaining clout of low-wage workers, especially those without a college degree, a minimum/entry-level wage of $16.50 is actually pretty high. Rep. Porter, however, pointed out that in pretty much any part of America you choose, a single mom with one child can’t make ends meet on that wage. She’s unquestionably correct, as she demonstrated after the hearing in this tweet (full disclosure: I’ve met Rep. Porter; she’s all that and a big bag of chips; whip-smart, data-driven…one of those new members with just the right recipe of heart, brain, conviction, analytics, etc…). You can read more about their exchange here, but it led me to ask why is the US wage structure so insufficient and what can we do about it? It’s a question that all of us should have at the top of our minds when listening to the proposals from those who would lead the nation. What can we do about this mismatch between earnings and needs? One answer is to work on two tracks, near term and long term. In the near term, we need robust wage supports in the form of fully refundable tax credits (i.e., you get the credit whether or not you owe any taxes), along with other work supports, including child care, health care, and housing. Foreign holdings of US debt have been coming down a bit. Is that a problem? 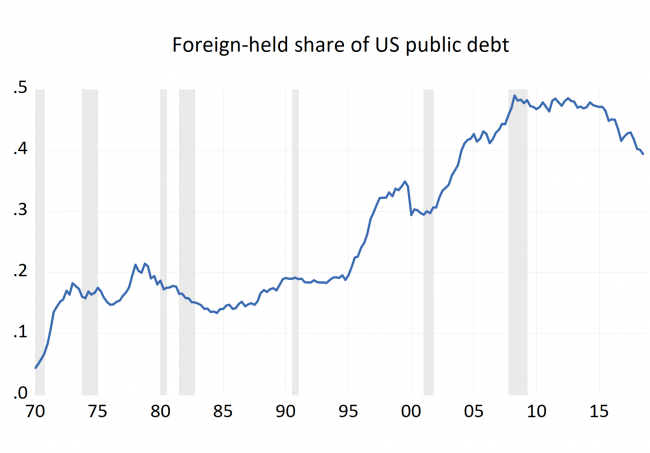 I remember when foreign ownership of U.S. government debt amounted to very little, as shown on the left end of the figure below (the share of total publicly held debt owned by foreigners). I next remember that this share was growing rapidly, closing in on half about a decade ago. What I didn’t know was that the share has been falling back a bit. In fact, it’s about 10 percentage points off of its peak. I discovered this because I went to look at the data as part of the broader conversation I’ve been engaged in regarding the lack of attention to and concern about our growing fiscal imbalances, an unusual dynamic what with the economy closing in on full employment. In the course of that conversation, some have raised the concern that because a significant share of our debt is held be foreign investors, we face risks that were not invoked in earlier decades. There’s the “sudden stop” scenario that’s been deeply damaging to emerging economies, when foreign inflows quickly shut down, slamming the currency and forcing painful interest rate hikes. There’s a less pressing but still concerning risk that foreign investors’ demand for US debt would fall at a time like the present, when the Treasury needs to borrow aggressively to finance our obligations in the face of large tax cuts and deficit spending. That scenario could lead to “crowd out,” as public debt competes with private debt for scarce funds, pushing up yields. At the very least, it leads to more national income leaking out in debt service than when those shares in the figure were lower. How serious are these concerns? New Census data show that low-income people are responding as they always do to tight labor markets…by working! One of the particularly frustrating, fact-free aspects of the conservative push to add (or ramp up) work requirements in anti-poverty programs like Medicaid or SNAP is that low-income people who can do so are already working hard. Moreover, as the job market tightens, they respond to tightening conditions. Using the new Census data, Kathleen Bryant and I, with help from Raheem Chaudhry, used the 2017 microdata (the data on which the poverty and income numbers are based) to compare the employment rates of low-income single mothers (with incomes below twice the poverty threshold) with prime-age (25-54), non-poor adults. We found that between 2010 and 2017, the employment rates of the low-income single moms increased by 5.4 percentage points (67.7% to 73.2%), while those of non-poor adults increased by just 1.2 percentage points (87.8% to 89%). 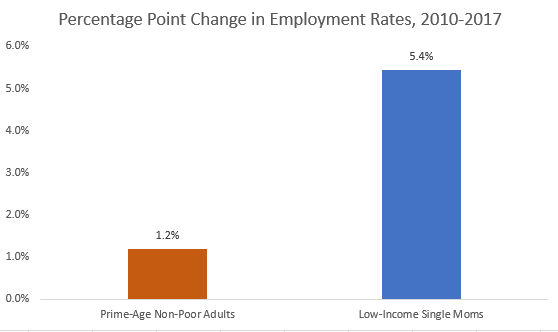 It’s true that the single moms, by dint of their lower employment rate levels, have more room to grow, but the prime-age adults are not obviously hitting a ceiling on their rates. At any rate, we believe this shows that a large and growing majority of low-income moms are already trying to both raise their kids and support their families through work, and that they’re actively taking advantage of the tight labor market. Adding work requirements will just give them one more needless, bureaucratic barrier to leap over, likely reducing their ability to maintain their benefits, even as they’re playing by the rules. Forgive me if I cynically suspect that such hassle-induced benefit losses are the point. Productivity and wages: They’re connected, of course, but the extent of the connection requires nuanced analysis of wages at different percentiles and movements in labor’s share of national income. There’s an interesting dichotomy here in how economists and people think about productivity and wages. For many economists, it’s the determinant of wage growth. For many people, it’s irrelevant, in that powerful forces divert productivity growth from paychecks to profits. The truth, especially once you get away from averages, lies in-between. Productivity matters a great deal, but it is not by itself sufficient to drive broadly shared prosperity. Employment rates also matter a lot: They take the elevator down in recessions and the stairs up in recoveries. They also may carry some info about the arrival of next recession. Plus, their recent movements reveal the disproportionate benefits of full employment to the least advantaged. Are politicians no longer listening to economists? You wish. In fact, they’re listening to the wrong ones telling them what they want to hear. Now, a quick note on current events. As regards the tanking of the Turkish lira, the business press is largely concerned with the contagion question: to what extent will Turkey’s problems spillover into European and American economies? The consensus is “not much,” based on Turkey’s size and financial markets’ limited exposure to Turkish debt, much of which is dollar-denominated, meaning it becomes more expensive to service when the Turkish currency depreciates. That’s probably right, and Turkey has uniquely weak fundamentals among emerging market economies: “current account deficit of 6.3% of GDP, Corporate foreign exchange debt is 35% of GDP, inflation rate of 16%.” But the situation bears close watching, of course, and the strengthening dollar has important implications for the trade war, i.e., it pushes in the opposite direction of the tariffs (tariffs make imports more expensive; the stronger dollar makes them less expensive). But another interesting aspect of the Turkish meltdown is how much Trump and Erdogan have in common. In one sense, that’s not surprising, as the strongman, faux populist playbook is pretty straightforward, and history is replete with examples. In the latest solid report on the conditions in the US labor market, payrolls grew by 213,000 in June, and labor force participation ticked up two-tenths, as more people were pulled into the improving labor market. This led to a two-tenths tick-up in the unemployment rate to 4 percent (really, 30 basis points up, from 3.75% to 4.05%). Wage growth stayed at 2.7 percent, the same pace as last month, and the average since last December. It is also worth noting that inflation is now growing at about the same rate as wages, so, in one of the less impressive aspects of the current job market recovery, real hourly pay is flat. –Average job gains of about 200,000 per month over the past year (see JB’s official jobs-day smoother which averages monthly payroll gains over different intervals). The historical pattern is for the pace of job gains to slow more than it has when we’re getting to full capacity in the labor market. –Though wage growth has clearly ticked up a bit—it has moved from 2 percent, to 2.5, to now, 2.7 percent—it has not picked up as much as we’d expect at full employment. Our current low productivity growth regime is a constraining factor, and we’re certainly hearing a lot from employers about labor shortages. But before we take that age-old complaint, we need to see more wage pressure. Employers almost always complain about labor shortages, yet the data suggests they’ve been quite reluctant to raise pay to get and keep the workers they need. The Republicans’ “Jobs Gap” is a meaningless measure that reveals nothing about the job market. It can, and is, easily manipulated to show any outcome you like. On the other hand, the facts about the current labor market are as follows. –The long-term trend of job growth remains solid, unemployment is low, and, contrary to claims related to the “jobs gap,” employment among working-age people is growing relative to their population. –Anecdotes suggest that some particularly hot labor markets are helping workers overcome steep labor market barriers, like criminal records. Conversely, some groups of workers face skill or health deficits, the absence of necessary work supports, or live in places that have not yet been reached by strong labor demand. –Even as the job market continues to tighten, wage growth has been relatively sluggish. Since late 2016, real earnings for middle-wage workers has been flat. The Republicans “Jobs Gap” measure consists of two disparate series—the labor force participation rate (LFPR) and job openings—with very different scales and no substantive meaning. The commentary around the measure suggests its advocates think the jobs gap shows that people are not taking advantage of labor market opportunities, but the actual data belie that claim. The LFPR is the percentage of the 16+ population that’s employed or unemployed (i.e., in the labor force), and job openings are millions of jobs. Importantly, the 16+ population includes persons of retirement age, an increasing share of the U.S. population, as well as teenagers in high school and young adults in college, so it is not a useful measure for the purpose it is intended (I show better measures below). Labor economists have long expected the overall LFPR to grow less quickly as the baby boomers age out of the labor force. But the immediate problem with the “jobs gap” is that there’s no meaningful way to present these two series on one graph. In fact, by tweaking their different scales in ways that make no more or less sense than the Republicans’ version, you can get a gap of any size you like or no gap at all! The teachers provide us with a teaching moment, over at WaPo. Their actions pose a stark reminder of the essential need for a strong, organized movement to push back on the forces promoting inequality, non-representative government, trickle down tax policy, and more. CBO released their updated “baseline,” or estimate of the US gov’t’s fiscal outlook. If you like red ink, you’re in biz. Instead of deficits between 3 and 4% of GDP over the next few years, we’re looking at deficits of 4-5%. As I’ve written in many places, when you’re closing in on full employment, you want your deficit/GDP to come down and your debt/GDP to stabilize and then fall. It’s not that I worry about “crowd out” so much–public borrowing hasn’t crowded out private borrowing for a long time, as evidenced by low, stable interest rates (rates are climbing off the mat a bit now, as I’d expect at this stage of the expansion). It’s a) there’s a recession out there somewhere are we lack the perceived fiscal space to deal with it, and b) the larger point that this is all part and parcel of the strategy to starve the Treasury of revenues so as to force entitlement cuts. Which brings me to this oped by a group of former Democratic chairs of the president’s CEA. It’s a perfectly reasonable call for a balanced approach to meeting our fiscal challenges, and, again, consistent with my view that as we close in on full employment, the deficit should move toward primary balance (another way of saying debt/GDP stabilization). This puts them in direct violation of the Bernstein Rule: if you supported the tax cut, you can’t complain about the deficit. I’ve long hoped, probably naïvely, that one of the benefits of team Trump’s promotion of generally ineffective (or worse) solutions to the downsides of trade could engender a debate about better ideas. Of course, the debate will also generate some really bad arguments, like this one from economist Donald Boudreaux in this AM’s NYT. “…estimates of jobs destroyed by trade sound big, but they’re actually tiny. Relative to overall routine job destruction and creation — “job churn” — the number of American jobs destroyed by trade is minuscule. In January alone, the number of American workers who were laid off or dismissed from their jobs was 1.8 million. The number of workers who quit their jobs that month was 3.3 million. Adding in workers who left their jobs for other reasons, such as retirement and disability, the number of job separations in January was 5.4 million. But there were 5.6 million hires in January, too. Those numbers are typical of most months. 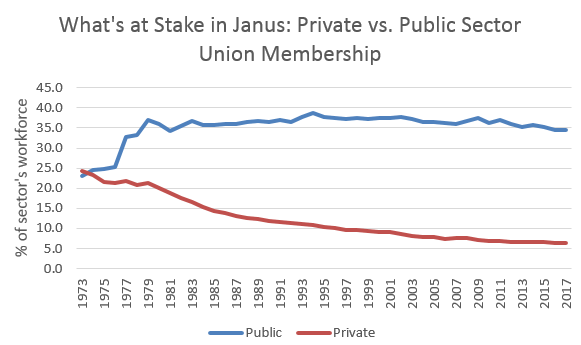 Lots of people think unions are pretty much kaput, but that’s not so, especially in the public sector, where union membership has been a bit north of one-third of the public-sector workforce, and remarkably steady, since the late 1970s (private sector coverage, by contrast, is 6.5%; see figure). That’s why the Janus case being argued at the Supreme Court today is so vitally important. Its outcome will either strengthen or weaken public sector unions, and if the result is the latter, it will have political repercussions far beyond the voice of workers in their workplaces. The Janus case is about whether public sector unions can require “agency fees.” Such fees, also called “fair share” fees, are paid to the union to cover the cost of bargaining on behalf of all workers in the bargaining unit, not just union members. Absent such fees, there is a clear “free rider” problem wherein those benefiting from collective bargaining activities on their behalf pay no costs to cover the union’s work. In that sense, Janus is kind of the public-sector corollary of the misnamed state “right-to-work” laws about which I’ve written elsewhere. The named plaintiff, Mark Janus, is an Illinois social worker covered under a collective bargaining agreement negotiated by the public workers’ union AFSCME (American Federation of State, County and Municipal Employees). He’s not an AFSCME member, but he’s required to pay a fee to cover the cost of his representation. Note that such fees can only be used for this purpose, and not for, say, political activities by the union. A nice wage pop in January should be welcomed, not feared! Payrolls rose 200,000 last month, the unemployment rate held steady at 4.1% and wage growth popped up to 2.9%, it’s the fastest year-over-year growth rate since mid-2009. In other words, here’s yet another strong jobs report. Our jobs-day smoother averages out some of the monthly noise in the payroll data by taking averages over 3, 6, and 12-month periods. 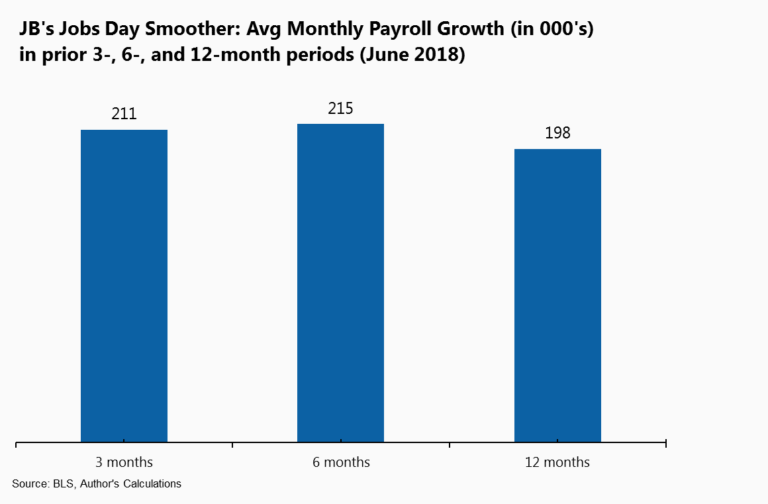 As shown below, payrolls are up a strong 192,000, on average, over the past three months, a very nice job-growth pace at this point in the expansion. In fact, the slight acceleration in the figure suggests there may be more room-to-run in this economy than we previously thought, which—co-inky-dink!—happens to be the punchline of a new paper from our Full Employment Project. As CNBC anchor Becky Quick pointed out this morning during their segment in which I joined, we may be entering that phase of the cycle where good news on Main St. is bad news on Wall St. That is, accelerating wage growth may lead the Federal Reserve to tighten faster, slowing overall growth more than currently expected. That certainly was the market reaction this morning, as the 10-year bond yield spiked on the report, suggesting concerns about future inflation and a more aggressive rate-hike schedule at the Fed. However, as I note below, there are excellent reasons to embrace and welcome, not fear, faster wage growth.